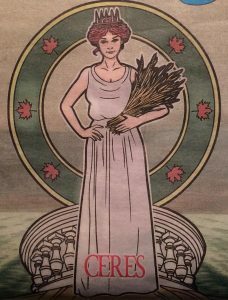 Image: Vermont’s Ceres, illustration by artist Steve Hogan for the cover of “The Bridge” newspaper, week of April 19-May 2, 2018. See more of Hogan’s “groovy art for your modern lifestyle” at Steve-Hogan.com. A new version of Ceres is being carved for the top of the Vermont Capitol dome, as the old pine statue is falling apart. This powerful New Moon in Libra is ruled by Venus and fueled by Pluto. Libra often has a “nice” reputation, known for being accommodating and relational. Maybe not so much this time. Venus in deep dark Scorpio matches up with Pluto, the Transformer, challenging this New Moon in Libra to scrutinize and investigate how well the sacred Feather of Truth balances the Scales of Libra. Pluto is a game changer in any sign, and in Capricorn the “rules” in play by are clearly changing. There are various interpretations of rules. In relation to the Libra’s Scales of Justice, we might again consider the phrase “Rule of Law” I brought up last time, and see what we comes to mind these two weeks later. More essentially than the political playing field, let’s look at the rules we, individually, play by. As we follow Venus downward and inward, are we being “fair,” to ourselves as well as others, in our attitudes and expression? It may not always be “pretty,” and this is the “dark side” both Pluto and Venus retrograde in Scorpio want to expose and have us confront the “mirror, mirror on the wall.” Through looking within we can awaken consciousness from the inside out, shedding any dried-out, snarky snakeskins, and tapping into our truest feelings of love and trust, evoking a fuller, richer sense of self. This is a deep piece of work, no doubt, with strong spiritual overtones, provided by Neptune in harmony with Venus. Dwarf planet Ceres accompanies this New Moon. Demeter to the Greeks, this goddess of the ancient mysteries adds more esoteric tone to this New Moon— as below, so above— and also a sense of concern and care for the wellbeing of all people and beings of Earth. Her great care is for food and farming, feeding the people, body and soul. She calls our attention to the Law of the Land as Natural Law. Shamanic Chiron, transitioning into Aries, has returned to sea sign Pisces for the next few months, to clear out some outstanding matters, freeing more “troubled waters” to pass under the bridge, thereby suggesting a musical interlude: Bridge Over Troubled Waters. There can be a level of grieving and purification in Chiron’s healing process, that resonates with Venus in Scorpio process of acknowledging and releasing regrets, sadness, hurts, etc. (in honor of Canadian Thanksgiving weekend) by Yo-Yo Ma and Alison Krauss, illustrated with a Libran flair. The underlying intensity of this seemingly smooth Libra New Moon calls for these very gifts. Let’s see where we find ourselves by the time Venus, as Morning Star, turns forward in mid-November. Venus will turn around on the Gifting Star, beautiful bright blue-white Spica, the brighest star in the angelic Virgo constellation, representing the grain she carries as the seed and fruit of the harvest. as Uranus in Taurus squares it up with Mars and Venus retrograde, and most importantly, with the Nodes of the Moon. This is a collective Call to Destiny. We are at a turning point, encouraged now to examine and tune in to how we are feeling after the wild roller coaster of these past few months (since May). Uranus will soon return to Aries for new inspiration and a few new surprises that will inform the way we end this year of 2018.